TVNewser noticed that Fox News Channel incorrectly identified South Carolina Gov. Mark Sanford as a democrat. The site reports: “The (D) on the lower third banner appeared for about seven seconds. 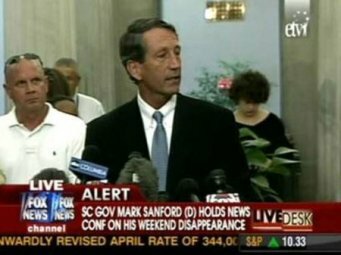 The banner was then switched to quotes Sanford was giving before the correct (R) designation was inserted” and also mentions this occurred in October 2006, Fox News mislabeled disgraced Florida GOP congressman Mark Foley as a democrat.